Have you ever wanted to ride a horse or take horse riding lessons? If the answer and yes than you have already made one of the best decision you will ever make. Horse riding is fun and great way to enjoy the outdoors. Horse rides let you feel the wind in your hair. If you're learning to ride a horse or an experienced horse rider, there are a range of horse riding experiences that will suit your needs.Horse riding in Sydney, Brisbane, Adelaide, Perth, Darwin, Melbourne and Canberra are all spectacular. Horse riding lessons in Newcastle, Port Macquarie, Hunter Valley and other regional locations are fun and makes a great gift or social occassion. Get outdoors today with your friends and try a horse riding lesson. This is horse riding at its very best just a stone's throw from Perth's northern beach suburbs. Let's go riding and enjoy the great Australian bush experience. The Flinders Ranges, a timeless landscape, filled with fantastic adventures and the perfect surrounds for your camel ride, a half a days drive from Adelaide. Ride with us on a "Man from Snowy River" adventure. We ride along mountain creek beds to the Howqua river from the movie. Eat lunch whilst perusing memorabilia from the movie at an exclusive riverside property. For the ultimate wedding proposal package that will have your loved one saying 'Yes!' at the end of the evening, this is it! Indulge in sparkling wine, Harbour views and more - all from your very own horse and carriage! This package is for the true romantics! Climbing aboard our luxury 'pioneer-style' Clydesdale-drawn wagons, your children will discover the 'sweet treats of the Swan Valley'. Sample fresh nougat, natural honey, sundried fruits as we follow the trail deep into the heart of the vineyards! Experience the Australian bush by horse riding at sunset through native forest abundant with wildflowers and native animals. The horse-back trails at twilight have a unique magic. This is an experience to share with someone very special. Come and join in on our 4 day Bushranger ride where you will experience riding through the New England Ranges on very reliable horses. Approximately 4-6 hours riding per day with a hot shower, country cooked meals and a comfy bed at the end of each day. Discovering the magic of free range horse riding is relaxing, fun, adventurous, exhilarating - you choose. We will provide you with an unforgettable horse riding experience, riding free range through unspoilt Australian bush and cantering across lush green valleys. Explore Australia's largest horse riding centre, with 3000 acres of lush green valleys and ancient rainforest trails at Glenworth Valley. Free Range Horse Riding is for experienced riders who wish to explore the valley at their own pace. Located 1 hour from Sydney. Explore 3000 acres of lush green valleys and ancient rainforest trails at Glenworth Valley, Australia's largest horse riding centre, located 1 hour from Sydney. Escape to the beautiful Megalong Valley in the Blue Mountains for one night at our bed and breakfast, just two hours out of Sydney. Your getaway includes a horse riding adventure through pristine wilderness and pastures. This is the perfect one-night escape for anyone who loves fresh country air. Go trail riding through the at sunset and discover the beauty of the native Australian bush just 25 minutes from Perth. Horse riding is the perfect way for you and a friend to experience the magic of the back country at twilight. Afterwards you'll enjoy a gourmet picnic and bottle of bubbly! Picnic in the Blue Mountains after a gorgeous trail ride! The beautiful Megalong Valley has beautiful scenery you won't forget. Just two hours from Sydney, your horse riding adventure will take you through gorgeous land to a gazebo where you'll enjoy a delicious picnic in the perfect setting. This horse ride takes you through the stunning Australian bush Savannah and spectacular rainforest where you can enjoy views from high mountain tops down to the Great Barrier Reef and the 500m magnificent Mowbray Falls. This wild, little touched region is yours to discover and experience. For an exhilarating combination of fresh air, Blue Mountains scenery and horse riding, go on this full day trail ride in the beautiful Megalong Valley. Your horse riding adventure is only two hours out of Sydney although with the pristine wilderness and pastures you'll feel like you're a world away. With a stable of over 70 quiet and gentle horses, this experience offers a safe and relaxing way to see the outback. With horses to suit all levels and ages (min age 4 years) this is a perfect family adventure. See Sydney's fabulous Centennial Park from the comfort of your saddle. Your personal guide will prepare you and your horse and will accompany you throughout this scenic ride of unique parts of Centennial Park. An hour's tour of Sydney like none other! Take some friends or the family to see Sydney's fabulous Centennial Park from the comfort of your saddle. Your horse riding guide will prepare you and your horse and accompany you throughout this scenic ride through Centennial Park. An hours tour of Sydney like none other! Take a friend horse riding and see Sydney's fabulous Centennial Park from the comfort of your saddle. Your personal guide will prepare you and your horse and will accompany you through out this scenic ride of not so often seen parts of Centennial Park. An hour's tour of Sydney like none other! Experience the unique natural wonderland of Noosa on horseback. Your horse riding journey begins in a bushland setting and takes you out onto the glistening white sands of Teewah Beach. Take in the panoramic view across the mouth of the Noosa River and Noosa's famous Hastings' Street. Horseride along the beach with horses that suit everyone's ability. Feel the wind in you hair as you ride along the picturesque beaches between Warrambool and Port Fairy. Take a friend or partner on a two-hour beach trail ride along the wild deserted beaches between Warrnambool and Port Fairy, just three hours from Melbourne. We have horses to suit everyone's ability, so come and feel the wind in you hair and experience the fun of horse riding along the beach! Horse riding along the beach with horses that suit everyone's ability. Feel the wind in you hair as you ride along the picturesque beaches between Warrambool and Port Fairy.Bring your partner and join the fun. Experience horse riding up Victoria's stunning High Plains! The Bogong Region beckons - it's horseriding across amazing and varied terrain. 4 days of camping, fantastic food, a seemingly endless sky - this experience is the ultimate way to find yourself in the great Australian landscape. Travel the adventurous trails of the early Aussie explorers. Back to the 18th century, to an era when motive power was horses, bullocks and mules. Ride a horse as only the affluent did, be a pioneer and experience the frontier lifestyle. We take you overland through our unique wilderness. 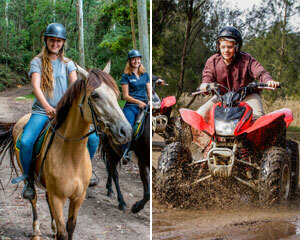 Experience the unique natural wonderland of Noosa on horseback. Your horse ride begins in a bush land setting and then stepping out onto the glistening white sands of Teewah Beach, taking in the panoramic view across the mouth of the Noosa River and Noosa's famous Hastings' Street.